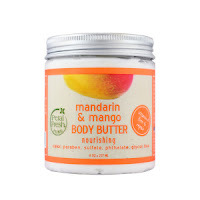 This feels incredible on the skin, leaving it soft and soothed. The smell? We love that. We've used many similar products. However, we've never come across this essence combination before. Aromatherapeutically speaking, citrus is a good aroma for lifting your mood. That aside, we just like it. It does just what it purports to do. It feeds and moisturizes our outer shells. Petal Fresh is dedicated to bringing you quality products for healthier, more attractive hair and skin. At Petal Fresh, we value natural ingredients and the beauty of nature without sacrificing the efficacy of our hair and body care lines. Our products utilize the medicinal properties of organic herbs to cleanse and nourish without the use of harsh chemicals. Petal Fresh uses only paraben-free ingredients, and our products are never tested on animals. When you select a product from the Petal Fresh line, you can take comfort in knowing you are making an affordable, healthy choice.